The information presented here is not originally mine, I did not discover it, invent it, or dream it up. We are going to share with you results of years of researching reports and yes opinions, by those who came before me and considered the natural lifestyle of the horse. It took myself several years of learning, reading, training, documenting with my own 9 horses to convince myself of the integrity of the barefoot concept. Hoof care seems to be based on opinion, whether one is discussing shod or barefoot. 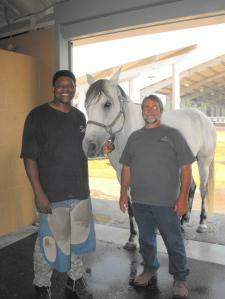 Natural equine hoof care is based on observation, experience, and common sense. We hope to inspire you to educate yourself about hoof anatomy, function, conformation, and adaptation, as well as the natural lifestyle of wild equids. We find it beyond all reasons to think that an animal with a 65 million year evolutionary history is incapable of living it's life and performing normally without the benefit of rigid fixed shoes nailed to the feet. Karla in Oxford Mississippi shows that barefoot walking horses can compete. Above is Joe Camp's horse Cash.He ia a friend and a client and this is after one year in Tennessee. This is a Thermograph of a horse which show the blood flow.Can you tell which hoof is shod?